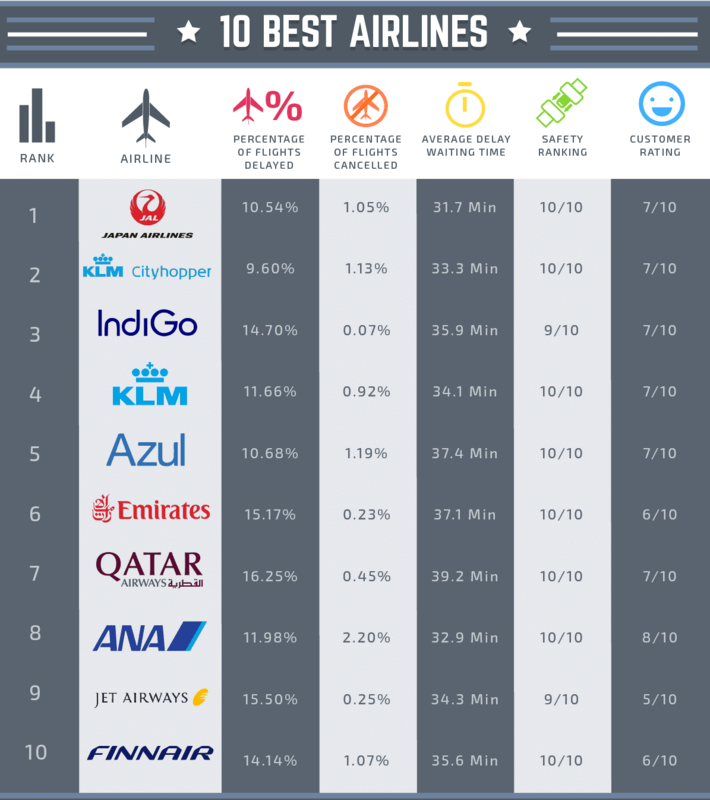 The U.K. medical travel insurance provider https://getgoinginsurance.co.uk cross-referenced data from AirlineRatings.com, FlightStats.com, FlightAware.com, and caa.co.uk for 50 of the world’s most popular airlines. The data, accessed in November 2018, determined the world’s most, and least, reliable carriers. The study took five key factors into account including percentage of flights delayed, average delay waiting time, the percentage of flights cancelled, safety ranking and customer rating. Japan Airlines, which operates 126 domestic and 54 international routes, came out best overall, with just 10.54 percent of flights being delayed and only 1.05 percent of flights cancelled during November. Dutch-based KLM Cityhopper actually had a smaller percentage of delayed flights, with only 9.6 percent of flights being delayed compared to Japan Airlines’ 10.54 percent. However, KLM Cityhopper had a slightly higher number of cancellations, with 1.13 percent of flights being cancelled and an average wait time of 33 minutes. IndiGo, the most popular low-budget airline in India, was third with 14.7 percent of flights being delayed and an impressive 0.07 percent of flights being cancelled. Persian Gulf carriers Emirates and Qatar Airways also made the top ten, in sixth and seventh place, respectively. Nearly 85 percent of Emirates’ flights arrived without delay, scoring a perfect ten out of a possible ten for safety, according to the survey. Qatar Airways lagged slightly behind, with nearly 84 percent of its flights running on time. At the other end of the scale? U.S. carriers, among others. BIG surprise! Frontier Airlines (NASDAQ:FRNT) came out as the least reliable of the 50 global airlines studied, with 30.64 percent of flights delayed and an average delay time of 65 minutes. American Airlines (NASDAQ:AAL) was the second least-reliable airline, with 18.07 percent of flights being delayed and passengers waiting around 61 minutes on average. Spanish-based airline Vueling, known for its affordable prices but widely criticized for its customer service, had 23.74 percent of flights delayed with an average waiting time 55 minutes. It was ranked the third least reliable airline of 2019. Jetstar, a wholly owned subsidiary of Australia’s Qantas, delayed nearly 28 percent of its flights and cancelled 2.13 percent of them. Air Canada also occupied a slot in the bottom ten, with 25.57 percent of its flights being delayed and passengers having to wait up to 46 minutes. Of the Big Three U.S. carriers, Delta Air Lines (NYSE:DAL) rated highest, at No. 24, while United Airlines (NYSE:UAL) was No. 37. Smaller U.S. carriers Southwest (NYSE:LUV), jetBlue (NASDAQ:JBLU) and Spirit (NASDAQ:SAVE) ranked No. 28, No. 33 and No. 39, respectively. Surprising to this Seattle-based writer, Seattle-headquartered Alaska Airlines (NYSE:ALK) was not included. Click here to view the complete study.